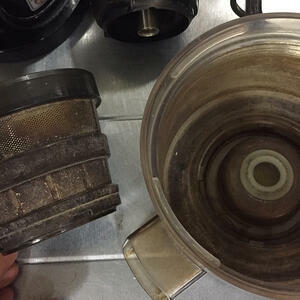 Since we service every juicer we sell, we asked our service department to tell us what are the most common types of damage they see, and how to avoid it. Besides "Don't put the juicer in the dishwasher" or "Don't drop the juicer", here are the most common mistakes people make that can damage their juicer. Hot water can cause parts to become deformed. Just a small change in shape can affect juicing performance, cause leaking, or even prevent assembly of the juicer. Hot or especially boiling water can damage the magnetic sensors in vertical juicers, which means the juicer will think the unit isn't assembled safely and will not turn on. Even the seals can be damaged, which can potentially lead to juice leaking into the motor. The rule of thumb is to never wash a juicer or its parts in water hotter than 80 degrees celsius. And don't dry parts in an oven or on a heater. 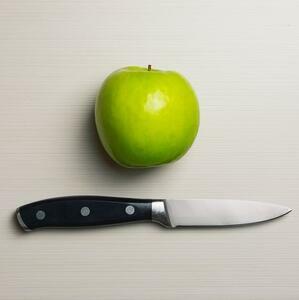 You're not sure where the pusher is, so why not just use a knife or brush to help feed produce into the juicer? You'll be careful not to push it too far. And then...oops! Either the knife is snapped, or the auger jams and damages the housing. It's one of the most common mistakes made with slow juicers, and one easily avoided. If you've lost your pusher, you can order a new one from our spare parts page. In the meantime, you can use a carrot or stalk of celery as a pusher until you find or order a new one. No cold-press juicer likes being rushed. Jamming in more fruits or vegetables while it is already full won't make it juice any faster and can in fact cause problems. Most vertical slow juicers have a built-in safety mechanism to stop the motor before this can occur. 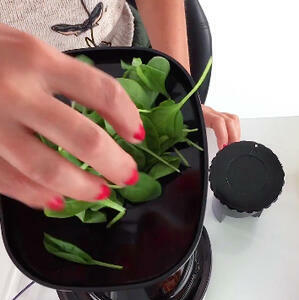 However you must be more careful with horizontal juicers, as they don't have this capability. Generally a horizontal slow juicer won't jam, but the excess juice will start backing up into the feeding tube. In the worst case, it could seep through the gasket and into the motor. The solution is simple: slow down. Most vertical slow juicers are self feeding, so just feed one piece of produce at a time and wait for it to process that before dropping in the next piece. With carrots, hold the carrot and let the vertical take little "bites" off of it instead of dropping in an entire fat carrot. With horizontal juicers, if you see the juice begin to back up, slow down. Let it process what it already has in the juicing chamber. After the juice is mostly extracted, slowly feed more produce. This is especially true for soft fruits like pineapple or strawberry. Besides being better for your juicer, feeding produce slowly has another benefit: you can get up to 15% more juice if you give your jucier the time it needs to properly process it. More and more often, we are seeing juicers damaged due to poor cleaning. You might not think an improperly cleaned juicer could cause damage, but it can. What happens is that dried juice residue or limescale can build up in the fine mesh of the juicing screen. As this accumulates, the holes in the screen become blocked, causing pressure to build up while juicing as there are less holes for the juice to flow. This pressure can cause the juicing screen to crack. In more extreme cases, the juicing chamber can crack, or even the motor can become overloaded and burn out. Again the solution is simple: clean the juicer thoroughly after every use. Be especially sure to clean the juicing screen of all juice or pulp particles with the cleaning brush. From time to time soak the juicing screen in a cleaning solution according to the user manual. Never let it get as bad as the one in the photo. Be kind to your juicer, and it will give you many years of faithful service.